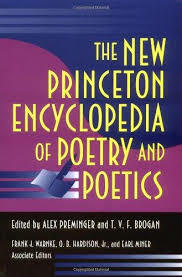 245 0 4 %a The new Princeton encyclopedia of poetry and poetics / %c Alex Preminger and T.V.F. Brogan co-ed. ; Frank J. Warnke, O. B. Hardison, Jr., and Earl Miner, assoc. ed. 260 # %a Princeton, N.J. : %b Princeton University Press, %c 1993. 300 %a XLVI, 1383 s. ; %c 24 cm.